Just imagine the power of a video wall built out of the PN-V701. 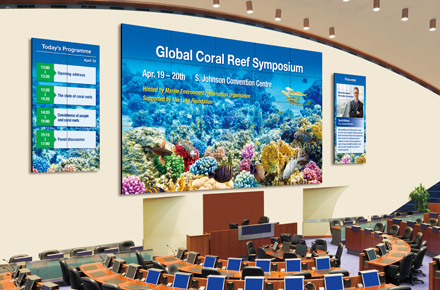 Huge, high-impact video walls can be created using fewer monitors with less bezel interruption across the entire on-screen image. And with upgraded colour calibration technology— SHARP Advanced UCCT—the PN-V701 gives high-quality video wall solutions that are sure to attract a crowd. The PN-V701 was developed specifically for use in multi-monitor installations in either portrait or landscape orientation. 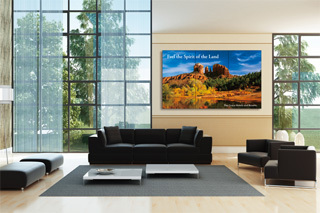 Thanks to its combined bezel width of just 4.4 mm*, large images on a video wall appear natural and almost seamless. The grand scale of the 70-inch monitor allows you to build video walls with fewer monitors and fewer bezels, which serves to minimise the non-displayed area. Whether in an airport, railway station, shopping mall, or other public spaces, the PN-V701 expands the creative possibilities of visual communication. The PN-V701 incorporates Sharp’s UV2A* technology to ensure highly efficient use of light from the backlight and prevent light leakage, resulting in truly bright whites and extremely deep blacks. The LCD panel also boasts 1,920 (H) x 1,080 (V)-pixel full HD resolution, making everything from fine text to intricate graphics stunningly crisp and clear. A brightness of 700 cd/m2 supports the PN-V701 in its digital signage duties. Four PN-V701 monitors set up in a 2 x 2 configuration, for example, can beautifully render every single pixel of 4K Ultra HD (3,840 x 2,160-pixel) content in a form equivalent to a huge 140-inch monitor. What’s more, the PN-V701 employs SHARP Advanced UCCT (Uniform Colour Calibration Technology) to achieve brilliant uniformity of colour and brightness across the entire video wall. The display characteristics of each small area in the LCD are measured in terms of RGB input signals. 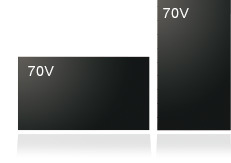 Uniformity of colour and brightness is then calibrated and corrected for each RGB signal element as shown in the graphs below. Sharp has further improved the accuracy of this technology for the PN-V701. The colour management of each monitor utilising 3D lookup tables (LUTs) achieves a high level of colour reproduction toward the predetermined target range. It greatly improves the consistency of colour quality between monitors creating a video wall. Note: Brightness level may decrease when activating SHARP Advanced UCCT. When high-speed video is played on a video wall composed of multiple monitors, slight image misalignments between vertically placed monitors can occur. As a countermeasure, the Inverse Scan function comes standard with the PN-V701. 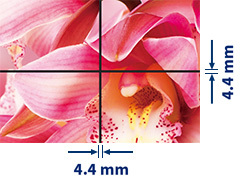 This corrects image misalignments by alternating the scanning direction between vertically adjacent monitors, creating smooth and natural images on a large video wall. The PN-V701 features an expansion slot to accommodate an optional HDBaseT Receiver Board (PN-ZB03H). Installing this board allows the PN-V701 to receive HDMI™ video, audio signals, and control signals sent up to 100 metres via a single LAN cable*1. This brings convenient connectivity with HDMI devices such as PCs and BD players. Compatibility with the HDBaseT 2.0 standard allows you to remotely operate a PC from a USB device connected to the optional board*2. With HDBaseT 2.0 support, you can use fewer cables and reduce the time and cost of installation. 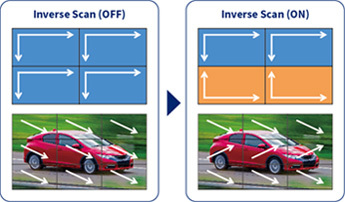 With Mirror Display mode*, the same image can be displayed on a daisy chain of PN-V701 monitors for the powerful impact of visual repetition. To ensure safe handling, the PN-V701 comes standard with heavy-duty carrying handles at four corners. The PN-V701 conforms to the RoHS Directive restricting the use of hazardous substances. The PN-V701 offers a choice of landscape or portrait installation, allowing customers to select the mode that best suits their display content and application. VESA-compliant mounts provide right/left pivot and swivel, ensuring a high level of safety when the PN-V701 is mounted on a wall or suspended from a ceiling. Thanks to its RS-232C interface, the PN-V701 can be easily controlled and monitored from a central location via a PC. Each monitor can be assigned an individual ID code to specify when remotely turning that monitor on or off, changing its input, or making various screen adjustments and settings. The PN-V701 can be easily operated through a Web browser and monitor control software*.